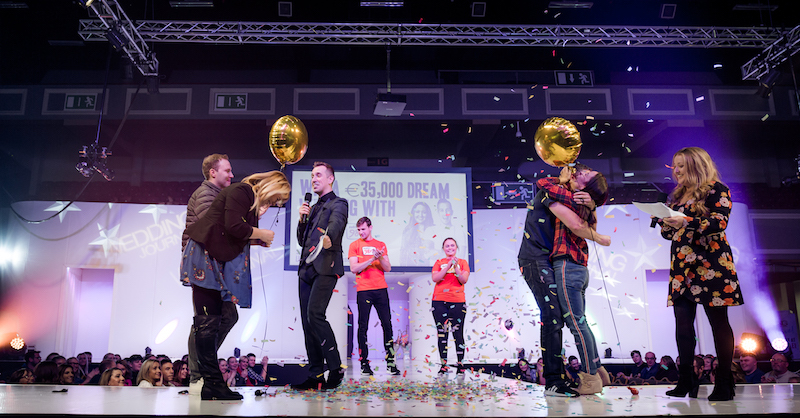 Introducing the lucky winners of The Wedding Journal Show €35,000 dream wedding competition – Amanda Lee and Darren Brennan. After five years together Amanda Lee and Darren Brennan got engaged on day of her 30th birthday in Bruges in 2013. ‘I thought I was actually going to Portugal, so Bruges was a total surprise for me,’ comments Laura. With plans to marry in 2015, the couple had to postpone because Amanda fell pregnant with their first child, Leila who is now three years old. 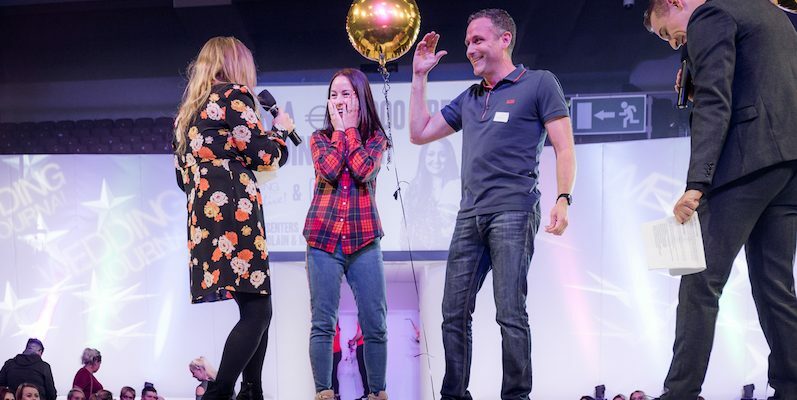 Then they decided to look at dates again in 2016 and booked for New Year’s Eve 2018 and in the meantime they have also welcomed their second child, another baby girl, Robyn who is six months old. 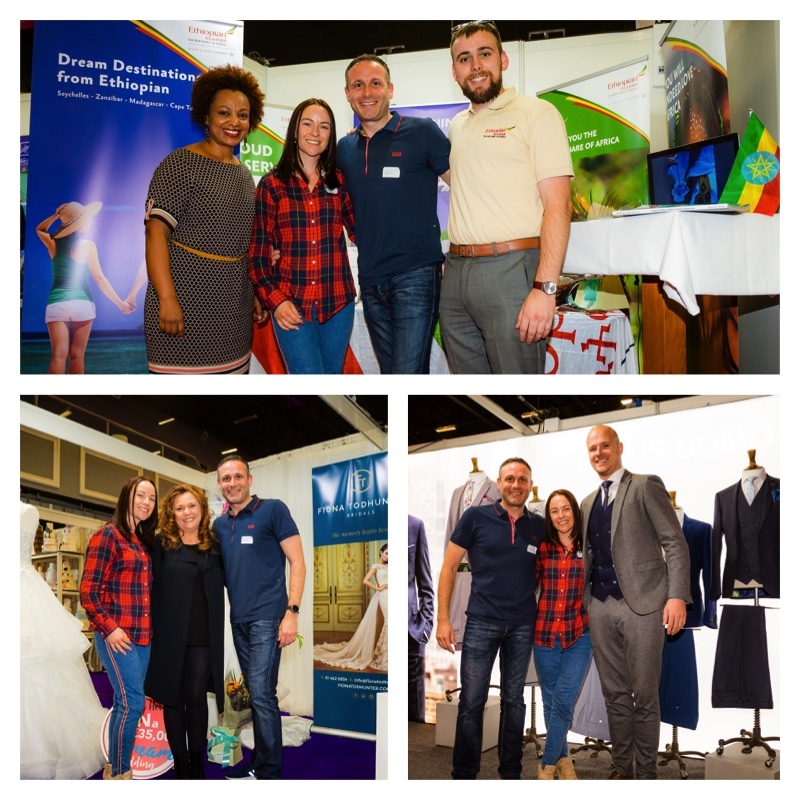 Amanda and Darren had both come along to the Wedding Journal Show in Citywest Convention Centre in Dublin on Sunday 23rd September, to pick up ideas for finishing touches and while there entered to win the €35,000 wedding. 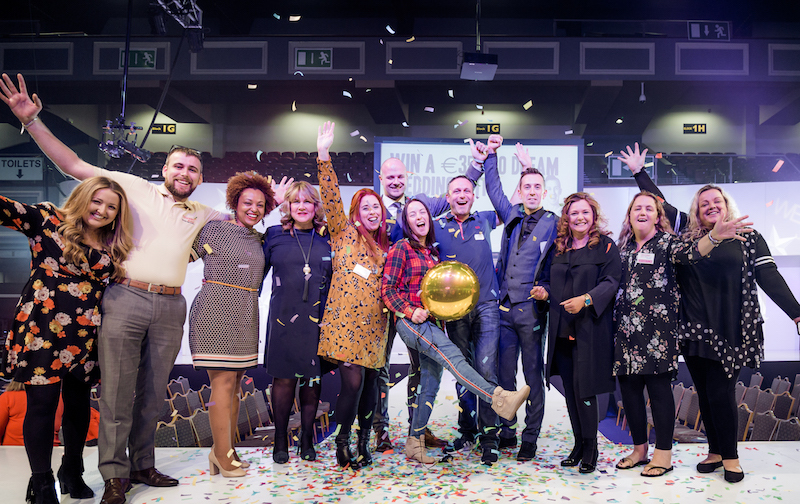 So, receiving a call to say they were successful and through to the live final that day was a total shock and welcome surprise. 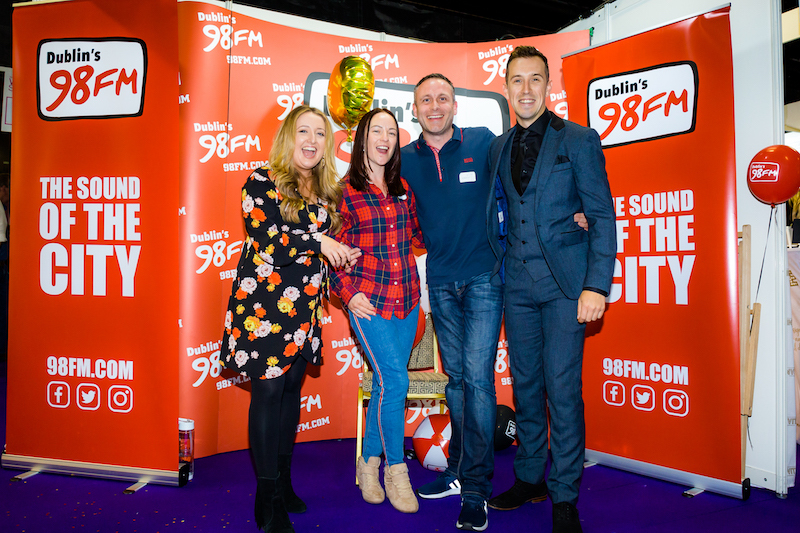 Joining the other sixteen finalists on stage, they were crowned the winning couple after completing a series of fun tasks on stage with 98FM presenters Rebecca Shekleton and Luke O’Faolain. 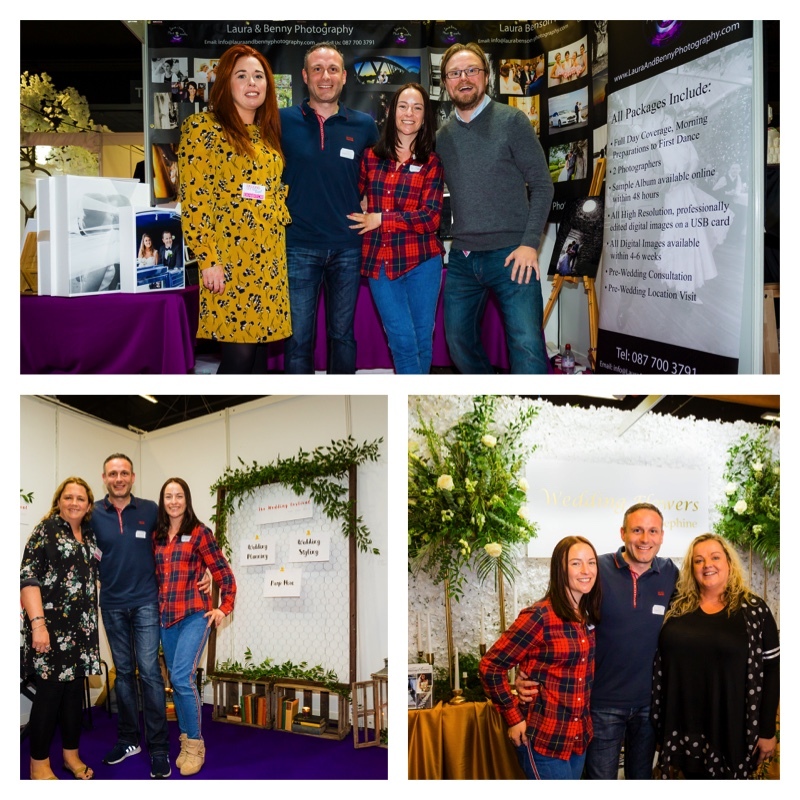 Win this fabulous amazing €35,000 wedding prize, Amanda and Darren can now plan their dream day at Killashee House with the help of venue stylist Melanie Dunny from The Wedding Festival, who alongside Josephine Higginbotham from Wedding Flowers by Josephine will create a dreamy backdrop for the couple’s big day. Between the two of these innovative and creative suppliers, they really will offer Amanda and Lee a truly individual and unforgettable day. Fiona Todhunter and her experienced team at Fiona Todhunter Bridals have many years of experience and Amanda will be able to choose a gown from Fiona’s own collection or from five international designers in-store. Plus, there is plenty of choice for her bridesmaids as well. As for Darren and his groomsmen, they will be able to pop along to Remus Uomo in St. Stephen’s Green, Dublin and select from the latest looks in sharply tailored suiting from this leading menswear brand. Capturing all the memories of their New Year’s Eve wedding are husband and wife photographic team, Laura and Benny Photography. This duo bring their own unique personality to their work, and are always happy to experiment and try out any new ideas the couple might have. 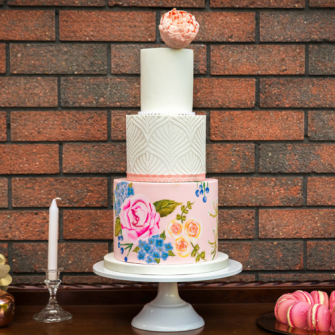 Last, but not least, taking pride of place on the day as well, will be the fabulous £1,000 wedding cake from Claire Does Cake! As well as all of these prizes to make their wedding day extra special, Amanda and Darren also won business class flights from Dublin to the Seychelles with award-winning airline Ethiopian, ferry transfers from Mahé to Praslin courtesy of Seychelles Tourism and of course a luxurious seven night stay in a Raffles Seychelles, sister hotel to the iconic Raffles Singapore, one of the most legendary hotels in the world! Laura and Ciara will stay in an ocean view pool villa, featuring contemporary interiors, as well as a spacious outdoor pavilion; complete with a day bed and a private plunge pool to soak up the sun and atmosphere!